Or minimum time off between shifts, etc. 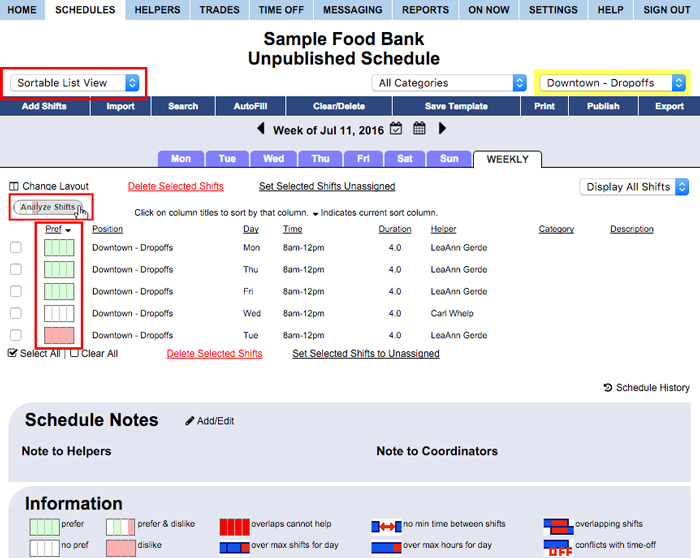 Conflicts could occur if helpers changes their preferences after you have created the schedule or if a coordinator has manually assigned a shift after being warned of a conflict, or if the helper picks up a shift off the Tradeboard. It can be useful to Analyze Shifts before publishing to check for any conflicts due to last minute changes to helper preferences or constraints. Your assigned shifts will be displayed with their corresponding status icon compared to the various preferences and constraints that are currently set. Conflicts will be listed at the top of the list.